St. Maximilian Kolbe understood the meaning of life. He knew that his Vocation was to give himself in love to Christ and to and for the Church, and he took this quite seriously. St. Maximilian Kolbe knew that true love involved sacrifice and he lived this out, giving his life for another man who was to be killed in the concentration camp at Auschwitz. SACRIFICE can often seem like a negative thing. It is easy to focus on what you are giving up instead of why you are giving it up or what you are gaining. 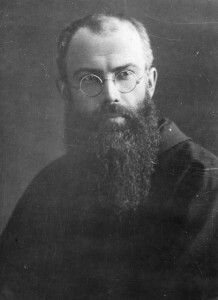 For St. Maximilian Kolbe, he was giving up the greatest gift that he had to offer, his life. Yet, he was also giving a man a chance to have life and to go back home to his family. His act was one of martyrdom and more than giving his life, he was gaining eternal life with Christ – perfect and complete happiness. We can look also to Christ’s sacrifice for us on the cross. Christ gave of His life for us because of His incredible love for us. He wanted us to be freed from sin and to be able to receive His love perfectly so that we could live as His sons and daughters. Christ did not count the cost of what He was giving up, but rather saw the joy of us living in freedom and that was greater to Him than anything else He had to give. SACRIFICE is not about losing. It is about love giving all that it has. It is about giving a lesser good in order to obtain a greater good. It is about preferring another to yourself. In discernment, it is important to embrace sacrifice as a way of expressing love for Christ. Whether it is a personal penance or a sacrifice on behalf of another, sacrifice allows your heart to be rid of lesser loves in order to create room to receive the great love of Christ. The more that you are open to receive the great love of Christ, the more you can understand where and how He is calling you to serve – both in the little ways and also in your Vocation. Sacrifice in the Christian life begins with the small things. It is about little ways that you can begin to prefer others to yourself, and also to grow in virtue and self-discipline. Practically speaking, sacrifice can be as simple as getting up earlier in the morning to set aside time for prayer, choosing not to eat something on a particular day and offering this up for an intention, and even choosing to react charitably instead of in anger when someone frustrates you. There is a myriad of moments each day when you are invited to make sacrifices. When you do these things joyfully in love, you learn to love as Christ does – you grow in your ability to live more selflessly and this will in turn lead you to a life of greater joy.